Baywater Healthcare is a responsible provider of home oxygen and its dispensing systems. For the benefit of our Ambulance Service colleagues here are a few guidelines on the equipment we supply and precautionary advice if you are called to an incident. It is important to remember that flow rates set on a concentrator at home match the patient’s current prescription and therefore should not be altered. Should a patient need to be transported to hospital, the concentrator should simply be switched off using the on/off switch situated on the front of the machine. All consumables, including tubing, must remain in the patient’s home. On some occasions, ambulance crews across our regions remove oxygen equipment from a patient’s home and take it along with them in the ambulance. Please remember this equipment is needed in the patient’s home to ensure their oxygen requirements are met once they are discharged from hospital. If the equipment is misplaced at the hospital then any discharge could be unnecessarily delayed to allow time for a Healthcare Technician to visit the patient’s home and replace any removed oxygen equipment. The consumables such as mask and tubing used for home oxygen are different from those the patient may use whilst in hospital. For example, the oxygen tubing used in the home will contain a firebreak which is an essential fire safety device and the oxygen percentages delivered by masks will vary. When a patient returns home they must only use the consumables supplied by Baywater Healthcare. If you or the patient require additional information please call us on our 24 hour/7 day customer helpline 0800 373580. 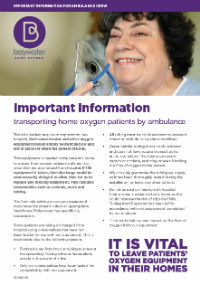 If you would like any further information or training on home oxygen equipment please contact us on 0845 602 0776.